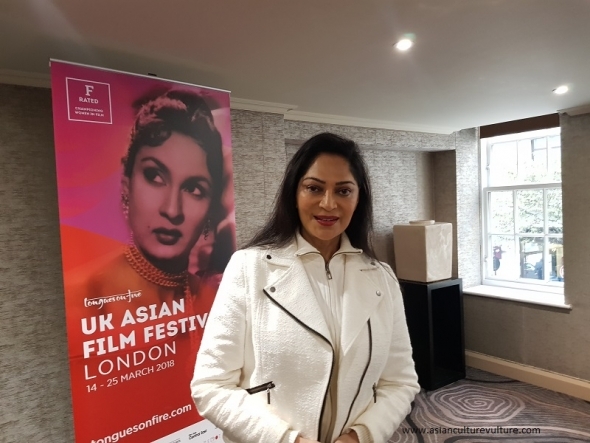 LUMINOUS, bright, ballsy and utterly without artifice, few could fail to be charmed by Simi Garewal at this year’s 20th anniversary UK Asian Film Festival. The one-time starlet, talk show icon and filmmaker lived up to her billing and some – in a festival that has always highlighted and promoted women in film. Celebrating 20 years – and originally created as Tongues on Fire and reincarnated several years ago as the London Asian Film Festival, it has now gone national (extending to Leicester, Manchester and Edinburgh) and this year all its films were F-rated, meaning they had a strong female component in the making or the message. Garewal is among its most articulate advocates and as well as speaking to us about this at the red carpet launch event on March 14 (https://www.youtube.com/watch?v=pEZXqaPIQQo&t), she also spoke expansively about her long career and www.asianculturevulture.com was among the audience for her introduction to the 1972 film, ‘Siddhartha’ in which she starred alongside Indian film legend, Shashi Kapoor. He died late last year, aged 79 and was widely recognised as one of the icons of Indian cinema. At the screening of ‘Siddhartha’, on March 17, Garewal spoke touchingly about the man she adored as an actor and a man. Among the audience was Karan Kapoor, Shashi’s London-based son and Janet Rooks, widow of Conrad Rooks who was the director of ‘Siddhartha’. Karan told the audience he had not seen the film before or at least he had no conscious recollection of it. “I was only about six or seven when Dad made it, and tomorrow is his birthday – what great timing,” he revealed. His brother Kunal features in the film as the central character Siddhartha’s son from his on-screen relationship with Garewal, who plays the mysterious and beautiful courtesan, Kamala. Mrs Rooks revealed that her husband, Conrad, put all his own money into the film and had to travel to Switzerland to meet the Hesse family who owned the rights to the book. The day before the screening, Garewal spoke to www.asianculturevulture.com and three other journalists from UK-based media. The day before the screening, Garewal spoke to www.asianculturevulture.com and three other journalists from UK-based media. Below are the excerpts from both her introduction to ‘Siddhartha’ and her near hour-long chat. ♦Simi Garewal reminisced about her time with Shashi at the Venice Film Festival in 1973 and how he reacted after the film was awarded a Silver Lion. “He used to work in commercial films and take all the money he earnt there and put it into memorable, meaningful films such as ‘Junoon’ (1979), 36 Chowringhee Lane (1981 and in which Shashi’s wife Jennifer Kendal starred. She died in 1984 and people often remark that Shashi never really was the same). ♦Shashi was instrumental along with his wife in creating Prithvi Theatre in Juhu, Mumbai. It is one of the best recognised artistic institutions in India today. She remembered the last time she saw him in Mumbai, and his daughter had warned Garewal that her father may not recognise his friend and one-time co-star. She explained her father had had a stroke and was not in good health and was in a wheelchair. ♦In her conversation with www.asianculturevulture.com, she revealed her hugely successful talk show, ‘Rendezvous’ will return to the screen sometime before Diwali 2018. She has also written a feature script with some present Bollywood talent in mind and hopes it will go into production in 2019. She also disclosed she has been writing a TV series which she expects to show on a digital platform. “I’ve just finished it, it is a mega mega script and I’ve spent two years writing it.” She declined to go into any detail about it. ♦She said her own website (see link below) is very frank and honest. ♦On being cast in ‘Siddhartha’. “I had read the novel (‘Siddhartha’) when I was about 16/17, at that age, you want to know what life is about, what lies ahead and I identified with the search. “I enjoyed it, so when someone says you can enact that book, it’s like winning a prize, I was delighted. ♦Her favourite film is the documentary she made for Channel 4 on Rajiv Gandhi who was India’s prime minister 1984-1989 and like his mother, Indira, was also assassinated. “We were with him nearly the whole four and half years. It really stands out and was a glorious experience. I learnt so much. ♦She would love to interview Sonia Gandhi, who in 2004 led the Congress Party back into government. “I admire her. I love her story. She was born in small town Italy and goes onto rule India. She is such an admirable and dignified person – look at the transformation. ♦She said her most memorable interview in some ways was Jackie Chan. The Hollywood star revealed he had got married because his girlfriend at the time was pregnant. ♦Her own hand at making a fictional feature film proved extremely difficult. She wrote and directed ‘Rukshat’ (1988) with Indian star in Mithun Chakraborty in the lead and the film shot partly in the US and India. She said both her assistant and choreographer on the film went missing – usually in the bar. ♦Much of her early life was spent in Twickenham, south London. Her father who was in the army, was a military attaché and she faced early resistance to what was a long-term ambition to act (from the age of about six or seven).